On-demand delivery apps directly connect customers with companies. These apps unleash the potential of mobility and enhance the value of your business. Let’s put it this way. How about facilitating people to book services with just a few clicks, and that too, on the move? The on-demand delivery app can make it possible, and in a way, it can assist your business to grow. What’s more, you can offer improved services and a pleasant experience to the customers. As per a survey, 86.5 million Americans or 42% of the adult population have already used on-demand services. It is sufficient to show the growing popularity of on-demand delivery. All you need to address the user’s expectations and market trends through an on-demand app solution. It is a quick way to offer services and give improved customer experience. Here are the major business benefits of on-demand app development. Think of Uber and Airbnb. They have remained favorite companies for angel investors. It is fairly possible that investors who have missed the bus can invest in the startup that looks promising. 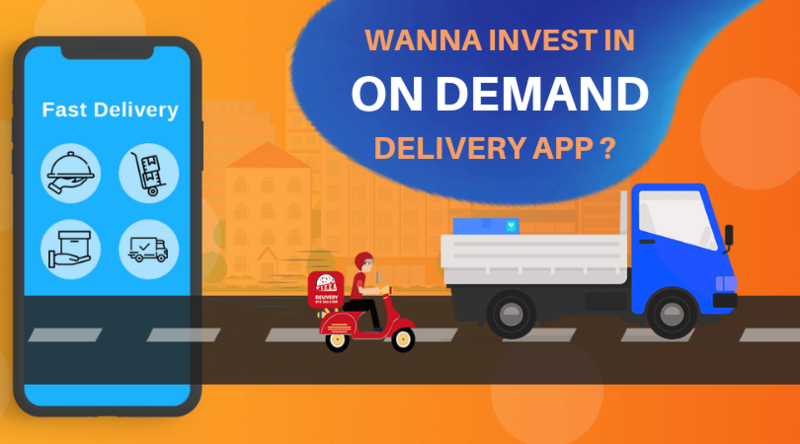 The on-demand delivery app development services can help you come up with such an efficient and user-friendly app that can attract many investors over the period. In other words, a robust business plan, your commitment, and an on-demand delivery app is a useful trio to attract investors. As a result, you can readily get crowd funding to strengthen your footprints across the world. What makes on-demand application service more popular globally is its ability to address the requirements of any business irrespective of scale and size. It is fair to mention that your business is not necessary to be well-established for leveraging the benefits of the on-demand delivery app. Even startups can also benefit from feature-rich and user-friendly mobile app. The biggest advantage of an on-demand app solution is your business can reach a huge audience for promoting your business. If you want to take benefits of localization, you can also do so with the help of a customized app. The on-demand app is a technological boon. It can assist your company to grab new opportunities. For example, if you want to target a niche market or a specific audience for your specialized services, the on-demand app can enable you to do it. For example, you own a healthcare facility, and the on-demand mobile app facilitates the patients to book the doctor’s appointment online. Also, it can assist you in managing the supply of prescribed medicines at the patient’s doorstep. In a way, the on-demand app development can help you grow business through improved and customer-centric services. One of the reasons why on-demand apps are in demand is it can meet the user’s expectations with ease. The on-demand app development services bring automation in the business processes and enhance the comfort of customers. For example, it is possible to meet the expectation of the same day delivery through an on-demand delivery app. It can assist the companies to get loyal customers. Also, on-demand apps are scalable to address the needs of the future. You can hire delivery app developers to modify and customize the app as per the current market trends and the user’s expectations. The on-demand apps can assist you to make services more customer-friendly and attract new customers. In a way, the app makes it easy to increase a customer base and you can expand business beyond borders. Your competitors who are yet to bring on-demand apps will remain behind of you and you can readily get an edge over them. Also, the on-demand economy is focused on youngsters and millennials. For example, millennials remain the main audience for on-demand services and products. Similarly, youngsters remain the major resources for fulfilling orders of on-demand services. In other words, a huge population of youngsters can take your business to the next level with the help of the on-demand application service. Like traditional mobile apps, the development cost for on-demand apps is based on three factors- features, complexity, and hourly rates. Usually, the integration of features makes the app more complex and takes more time of developers. It results in increased on-demand app development cost. Talking about the hourly rates, here is a brief guide for you if you want to hire delivery app developers. The developer’s hourly rates are different across the world. It can impact the overall app development cost. There is a huge variation in the hourly rates between countries like India, US, and Australia. On one hand, the US and Canada-based developers charge a whopping $150- to $200 an hour, and on the other hand, Indian app developers take between $25-$50 an hour. It is better to hire Indian app developers to save huge bucks on development especially if you own a startup or having budgetary constraints. Considering all these factors, it is fair to assume that you can get an on-demand app with basic features between $8000-$10000. This investment can give you a large return if your business model is capable of managing bulk orders for services. Also, an on-demand delivery app with user-friendly features and attractive interface can build and enhance the brand reputation for your business online. The on-demand economy is growing at a fast pace. The on-demand app solution remains handy to tap into opportunities offered by the growing demand for on-demand services. The on-demand app can connect the management, employees, and customers. You can improve customer services and reach a huge audience through a seamlessly-performing on-demand app. In a way, you can get a higher return and take your business to the next level. We are one of the best on-demand app development service providers globally. Our experienced app developers can build a feature-rich on-demand app for various industry sectors ranging from restaurant to cab-booking and healthcare to logistics. We integrate technological advancements for providing a rich user experience.